Chicken wings, of all varieties, pair perfectly with just about anything. 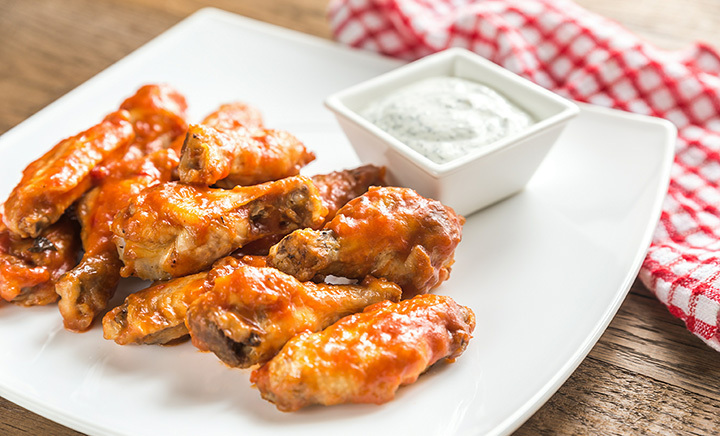 Whether you’re kicking back to watch the game with friends or looking to snack on a delicious appetizer with a cold beer, wings are the move. In the business of chicken wings, South Dakota is seriously underrated. Chow down at the 10 best chicken wing spots in the state! Murphy’s is the locals favorite watering hole—and for good reason! The wings are legendary around the state. Flavors include Buffalo, Asian glaze, strawberry habanero, and watermelon barbecue. The environment is comfortable and inviting in a building with a rich history. This pub also serves other classic American dishes such as sliders, soups, wraps, sandwiches, macaroni & cheese, burgers, and more. Alcohol includes 22 beers on tap and 40 more bottled, a diverse wine selection, and a unique cocktail menu. See you at happy hour! Kim’s Korner serves beer, wine, and liquor in addition to classic American food such as burgers, sandwiches, pizza, and chicken wings! Wednesday is Wing Night with 60-cent wings from 6 p.m. until close. The bar is friendly and welcoming in a way that you will only find in small Midwestern towns like Worthing. You will never want to leave! 212 Boiling Point is well-known to SoDak chicken wing aficionados due to their huge variety. Available sauces include bourbon, barbecue, citrus chipotle, gold, pro gold, spicy barbecue, mild, medium, hot, extra hot, and chile garlic. Dry rubs options are also available with Frank’s Red Hot dry rub and parmesan garlic rub. Monday is wing night with 60-cent boneless or traditional wings from 4 p.m. to 9 p.m.. With so many unique offerings, you will never get bored of 212 Boiling Point! Woody’s has great tap beers, great American food, and even better wings! Available sauces are original, gold barbecue, Caribbean, extra hot, spicy barbecue, teriyaki, and mango habanero. Wings are available in orders of six at $5.49 or 12 at $10.49. Other menu items include pizza, nachos, burgers, sandwiches, soups, and salads. Reasonable prices and a wide variety makes this bar a top spot for chicken wings! Botski’s is famous around Sioux Falls for their fresh and crispy chicken. Not only are wings available but also pieces like legs, breast, and gizzard. Sauce options are Buffalo, gold, barbecue, and spicy honey sriracha. Other menu items include a small offering of beer, burgers, sandwiches, wraps, and salads. TC’s Referee has over 101 beers, 12 ice cold tap beers, burgers, and one-of-a-kind chicken wings. TC’s Famous Wings can be ordered in groups of 10 for $9.99, 20 for $18.89, or 50 for $46.19. Available sauces are Buffalo, Gold, Hot Fever, Sperls, Thai chilli, Golden Thai, teriyaki, and barbecue. Wings are available both bone-in or boneless. You will be impressed with the food, service, and atmosphere at this welcoming neighborhood bar and grill! Conveniently located in historic downtown Aberdeen, the Circus Sports Bar & Grill has quickly become one of the most fun bars in the state. On Wing Night, Circus Wings are just $6 per pound when dining in. Feeling brave? Order the “Nuclear” wings! Other options are mild, hot, or barbecue. Single orders are $8.99, and double orders are $16.49. Other popular menu items include the shrimp basket, club sandwich, Chislic, Cowboy Burger, and the Cuban burger. No matter what you order, you will savor every bite! This unique pub is in located in the building of the historic Mitchell train depot, built in 1908 and used for over 40 years. In 1990, it was beautifully restored and is now a registered historical site. The chicken wings are equally awe-inspiring. They are served either traditional or boneless. Available sauces are teriyaki, barbecue, honey barbecue, spicy hot Buffalo, super hot Buffalo, Jack Daniels, or honey mustard. Other popular menu items include Nacho Supreme, Depot Burger, South Dakota Buffalo Burger, and ribeye steak. Vegetarian options are available with salads and the veggie burger. Steerfish is the newest steakhouse on the Spearfish restaurant scene—and they’re blowing the competition out of the water! In addition to other hearty American food menu items, their wings are a Spearfish favorite. The Wyo Wings, either bone-in or boneless, have sauce options of traditional, barbecue, spicy garlic parmesan, or Buckin’ Hot. Steer your way to this restaurant for mouthwatering wings! This award winning North Dakota-based restaurant has expanded to Rapid City, much to the satisfaction of South Dakota foodies. Sickies Garage offers a variety of interesting burger creations, craft beers, and chicken wings galore! Twenty wing sauces are offered, such as PB&J, sweet chili, Bloody Mary, Kicking Bourbon, Jamaican jerk, mango habanero, and many more. Come to Sickies Garage for all-you-can-eat late night wings!